Three Against One: A New Niece On The Way! 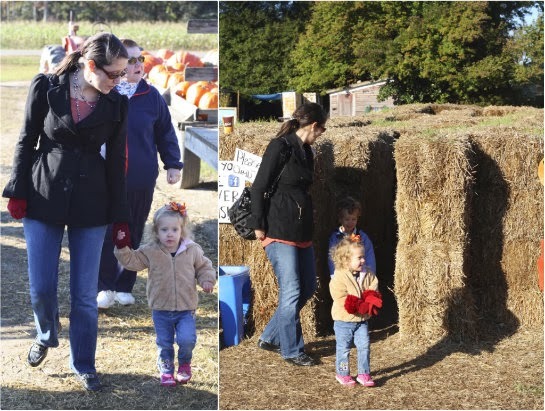 Yesterday we talked all about our time spent with our nieces and nephew at a local pumpkin patch. What we didn't tell you is, we are excited that my sister is expecting her 4th child come March! That's right, my sister is expecting once again and we all just found out yesterday that we'll be welcoming another little girl into the family — this will be our 3rd niece on her side. You can see a little bit of her baby bump peeking through her coat above. All of her 3 children have been very excited about the new baby, taking turns guessing if it would be a boy or girl and what they'd like to name it. If it were completely up to Virginia, Benjamin and Sophia, the new baby would have been named any one of the following: Farmer Buckaroo 2, Chelsea or David. It sounds like Chelsea might be a strong contender, but we'll have to wait and see. It will be fun to see what my sister and her husband decide on and to have another little one around to spoil. Her oldest, Virginia, had been hoping for another little sister and Benjamin had been hoping for a brother to even the pack out. We heard through the grapevine that Benjamin was a little teary-eyed at the initial announcement, but it gives us all reason to tell him just how special he is. Are there any other families out there with 3 girls and 1 boy or vice versa? We'd love to know more about your adventures in such a scenario (either growing up or parenting) in the comments section below. This makes me laugh, as at one point I was the only girl, with three brothers. Of course this ratio only lasted 2 years until my sister was born and then another brother 2 years later. Your sister's life will be full of laughter and love - BIG families are fun! I cannot believe I missed this! And now she has arrived. Huge congrats to you all!